Actually these plates are not as "monsterous" as what was supplied in the JPX engine install wing upgrade kit (see pic). There are several ways one could do this. JPX engine install upgrade kit. Reinforcement plates and " Mount Pads". Perfect Shannon. It is all clear now. The final (hopefully) questions: Are the G412 and F423, 6061 T-6? What guage? 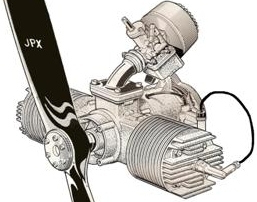 I do not have the exact specs and diemensions for the materials that were shipped with the JPX install wing upgrade kits (motor mounts, box section, ect). I also do not have the exact thicknesses for 412's and 423 mount pads. What I'd do is get with George as he has installed a factory type set-up. My mounts (plates) however were custom fitted for a doubled D-cell skin wing so they are a little different than what you will need with standard skin. just an update: my lazair is ready for test flight finally, after almost 4 years of trial, error, rebuild, recover, podification and modification. we did a weight and balance today, a true one too. for an empty weight of 365 pounds! so, she's not a light bird, but she's got the elite modifications so it should be fine. Then, I climbed in with my limber weight of 270 pounds and 6'7" frame and we hung it at 15" aft of leading edge and the tail came up before the mains - good news! then we hung it from 12" aft of the leading edge and the mains came up first - perfect. test flight soon when i have more days off. thanks for all the help myles! Tyler re-check the total weight figure, 365lbs empty seems a tad high ??? Shouldn't your plane weigh about 260-270 with the engines but without the full fairing ??? Lazair SS EC with electric start KFM's was listed at 343lbs. well i feel a lot better about my bird knowing that, thanks guest! I'm only above that number by my parachute when you consider the JPX's are probably slightly lighter than the KFMs. yeehaw!